The worlds largest economy surged by 5 percent in the third quarter, expanding at the fastest pace since the same period of 2003, as U.S. consumers and businesses spent more than previously estimated. (Bloomberg) — Stocks rose a fifth day, sending the Dow Jones Industrial Average past 18,000 for the first time, while Treasuries fell as data showed the economy grew at the fastest pace in a decade. European equities extended a rally, the ruble advanced and oil climbed. The Standard & Poor’s 500 advanced 0.1 percent to a record at 10:38 a.m in New York, while the Dow average added 66.53 points to 18,025.97. The Nasdaq 100 Index retreated 0.4 percent as biotechnology shares in the gauge plunged a second day. The Stoxx Europe 600 Index increased 0.4 percent, heading for its sixth gain in the longest winning streak since April. The yield on 10-year Treasury notes rose four basis points to 2.20 percent. The Bloomberg Dollar Spot Index touched a five-year high as oil appreciated. The world’s largest economy surged by 5 percent in the third quarter, expanding at the fastest pace since the same period of 2003, as U.S. consumers and businesses spent more than previously estimated. The S&P 500 soared 5.4 percent over the previous four days after the Federal Reserve’s pledge to be patient on the timing of interest-rate increases helped stocks recover from a plunge earlier this month. Gross domestic product grew at a 5 percent annual rate from July through September, the biggest advance since the third quarter of 2003, and up from a previously estimated 3.9 percent, revised figures showed. Separate data showed consumer spending rose more than previously estimated, while orders for U.S. durable goods and purchases of new U.S. homes unexpectedly declined last month. The dollar rose and Treasuries fell on speculation the data, along with higher employment and lower gasoline prices, supports the case for the Fed to raise interest rates next year. Two-year note yields rose one basis point to 0.73 percent, reaching the highest level since April 2011. The Bloomberg Dollar Spot Index, which tracks the U.S. currency against 10 major counterparts, rose 0.3 percent as the greenback advanced for a fifth day against the yen. The index earlier touched the highest closing level since 2009. The dollar climbed 0.5 percent to 120.69 yen. The U.S. currency added 0.4 percent to $1.2183 per euro after appreciating to $1.2180, the strongest since August 2012. The euro rose 0.2 percent to 147.05 yen. It’s been 172 days since the Dow closed above 17,000 on July 3, data compiled by Bloomberg show. That’s the fifth-fastest trip between thousands, with the record being 35 days to 11,000 in May 1999. It took the index almost 5,200 days to go from 1,000 to 2,000 between 1972 and 1987, according to Howard Silverblatt, an index analyst at the New York-based S&P Dow Jones Indices. The Dow closed at a eight-month low on Oct. 16 before rallying more than 1,882 points, or 12 percent, to today’s record. Nine of the 10 main S&P 500 groups advanced today. Health care stocks sank 1.9 percent as Celgene Corp., Regeneron Pharmaceuticals Inc. and Biogen Idec Inc. each plunged at least 4.3 percent. 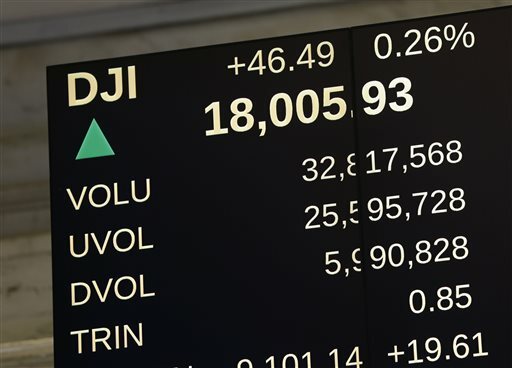 The S&P 500 and Dow average climbed back to record levels yesterday after a slide in oil prices and a worsening of the financial crisis in Russia rippled through financial markets earlier this month, wiping more than $1 trillion from U.S. equity values in less than two weeks. The S&P 500 lost 5 percent in the seven trading days through Dec. 16. Yesterday’s gains in the index completed the fifth recovery this year from a decline of 4 percent or more, only 17 days after it started. In comparable drops beginning in January, April, July and September, the benchmark gauge needed about a month to erase losses, data compiled by Bloomberg show. The S&P 500 ended yesterday up 0.5 percent for December and 12 percent this year. The Stoxx 600 is heading for its biggest six-day gain in three years and has regained 6 percent from its Dec. 15 low. Greek bonds fell as Prime Minister Antonis Samaras failed in his second effort to get lawmakers to back his nominee for president and avert snap general elections. Greek 10-year yields 11 basis points to 8.43 percent. The yield on German 10-year bonds fell one basis point to 0.59 percent, about 3 basis points from a record low. Oil rose, with West Texas Intermediate climbing 1.2 percent to $56.01 a barrel, after falling 3.3 percent yesterday. Prices are down 43 percent this year. Brent crude added 1.1 percent to $60.78 a barrel after slipping 2.1 percent last session. Oil inventories in the United States, the world’s largest consumer, probably dropped for a second week through Dec. 19, a Bloomberg News survey of energy analysts showed before data tomorrow. The ruble strengthened for a third day, advancing to 55.3403 a dollar on speculation the government ordered companies to convert more of their foreign revenue into rubles amid efforts to recover from the nation’s worst currency crisis since 1998. The yield on five-year government bonds rose seven basis points to 15.2 percent. Russia instructed five state-controlled exporters, including OAO Gazprom and OAO Rosneft, to reduce their foreign exchange holdings by March 1, the Kommersant newspaper reported, citing a Dec. 17 directive from Prime Minister Dmitry Medvedev. Emerging-market stocks fell, with the MSCI Emerging Markets Index dropping 0.8 percent. Dubai’s DFM General Index lost 3.4 percent, taking this quarter’s plunge to 26 percent. The Shanghai Composite Index slumped 3 percent, paring its surge over the past month to 20 percent. Hong Kong’s Hang Seng Index fell 0.3 percent and the Hang Seng China Enterprises Index, which tracks mainland Chinese shares listed in the city, lost 0.6 percent. Japan’s markets were shut for a holiday. Gold futures slipped 0.2 percent to $1,175.80 an ounce. With assistance from Cecile Vannucci, David Goodman, Natasha Doff and Inyoung Hwang in London and Joseph Ciolli, Susanne Walker and Andrea Wong in New York.